Seligman Walmart Neighborhood Market manager Ben Stoerger presents a check for $2,000 to Police Chief Terry Burgess for the Shop with a Cop Program. This year marks the most successful fundraising year for the Seligman Shop with a Cop program to date. The Seligman Police Department has raised $9,500 to take underprivileged kids shopping for presents this year, more than double last year’s record total. 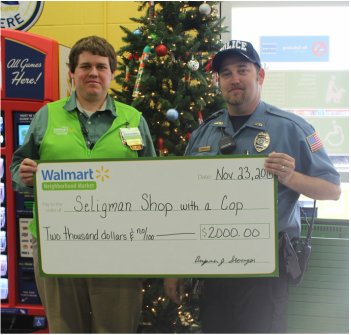 Big donations for the year included a $2,000 check from the Seligman Walmart Neighborhood Market, which was presented to Chief of Police Terry Burgess on Monday, November 23, by store manager Ben Stoerger. Burgess said, “The program is very grateful that the new store manager donated along with the Cassville Walmart and Walmart DC in Bentonville. It really helps make the program a success along with all of the other donations.” The Cassville Walmart gave a check for $1,500, and a variety of local businesses, like White Oak Station, D & D Oil of Wheaton, Eagan’s and others also contributed to the cause. This year, Seligman Police Chief Burgess and Officers Aaron Kyser, Fernando Ortega, Matt Phillips and Joseph Arnold will take the children selected for the program shopping for their gifts at the Cassville Walmart on December 13. Businesses can continue to donate to the program up until Friday, December 11. In terms of the large amount raised this year, Burgess said, “I think the early start with fundraising gave more businesses an opportunity to donate. I started the preparation and applying for Walmart grants back in October. I reached out to business and that probably helped the most with how much was raised. Children can still be nominated to the program by contacting the Seligman City Hall, 29144 Main Street, or (417) 662-3600 until Monday, November 30, at 4:30 p.m. The children will be selected starting December 1 and their families notified on how to proceed.